In the “Wright Diet”, Celia Wright describes the over-acidic person as being grouchy, sensitive, inclined to aches and pains, headaches, problems with sleep and acidity of the stomach. Does this sound like you? Many identify with these symptoms. According to supporters of the theory, it can also indicate more serious conditions like osteoporosis and cancer! So how can we know whether we’re over-acidic? The claim is that your acidity (or lack of) can easily be measured by testing the pH of either your urine or saliva. The urine pH test is the most popular. pH is a measure of how many parts Hydrogen is in a substance. The lower the figure, the more acidic it is. The higher the figure, the more alkaline it is. Dip one strip into a urine sample or spit into a spoon and place a strip into the saliva. Wait a couple of minutes and the ph strip will change in color. It’s best to measure the first saliva or urine of the morning. Match the color with the chart provided to get the reading .A number below 7 indicates acidity whereas a number above 7 indicates alkalinity.Number 7 is neutral- neither acidic nor alkaline. Ideal reading is about 7 to 7,5. DOES ACIDITY LEAD TO MANY HEALTH PROBLEMS? What is this test telling you? If you have either acidic urine or saliva, according to proponents, it’s a good indication of the acidity or alkalinity of your blood. It is also an indication, they say, of your body compensating for this bad condition by robbing the bones of calcium in order to neutralize the acid in your blood. Calcium is highly alkaline. Obviously, robbing your bones of calcium is going to lead to osteoporosis. Acidic blood leads to many health problems besides osteoporosis. However, it can all be reversed or lessened by eating more ‘alkaline forming foods’. Supporters of the Alkaline Diet and the Hay Diet – where you eat about 80% alkaline forming food and 20% acid forming food – say that when our bodies metabolize foods, certain end products must be eliminated. These end products are called ‘ash”. The ash may be either acidic or alkaline. Meat, as a source of protein, and diets high in protein tend to produce more acidic ash in the urine. According to the theory, this indicates that the blood is on the acidic side too. To neutralize the acidity, there is some evidence that calcium can be taken from the bones. This is the basis of the belief that diets rich in meat cause osteoporosis. One of the biggest and most recent studies taken from they Framingham Heart Study looked at the impact of diet on bone mineral density over a 4 year period. The consumption of Magnesium, Potassium, fruits and vegetable ( all alkaline substances) were associated with lower bone loss. Supporters of the Alkaline Diet also claim that, as an added bonus , craving of all sorts seem to decrease with this way of eating. 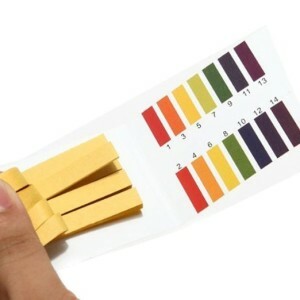 However, they say, the first step to these fantastic benefits is the pH test using pH test paper or urine pH test strips. Opponents of the Alkaline Diet and the Hay Diet as well as the pH test, say that the amount of acidity in our urine does NOT give us a meaningful insight into our health. I have not read anything negative about the saliva pH test and many alternative health practitioners reject the urinary pH testing and only measure saliva. 2. 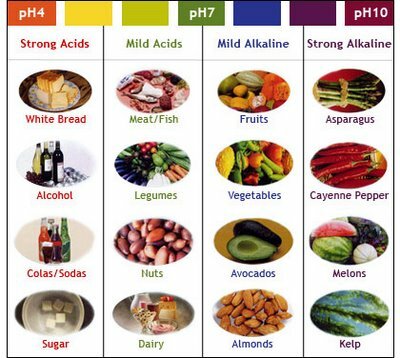 Our blood HAS to stay at a pH of 7,4 (slightly alkaline). Any significant change ( below 7 or over 7,7) means certain death.Your body has a series of buffers and compensation mechanisms to keep the pH from moving far from 7,4. 3. To say that our whole body has a uniform pH is not correct. For example the pH of stomach acid is about 3 ( very acidic). 4. Eating ‘alkaline forming foods’ will not alter the pH of your body at all.The reason is that all food which passes from the stomach to the intestines is neutralized by digestive fluids and enzymes. So, they claim, everything we eat ends up as the same pH ( alkaline). This is regardless of whether we ate acidic or alkaline food. Regarding the end product of metabolized protein, or more specifically meat, called “ash”, it’s claimed that if it’s acidic there may be some evidence that calcium is being leached from the bones. But they maintain that it’s not that simple. mentioned earlier which looked at the impact of diet on bone mineral density over a 4 year period and concluded that a diet rich in Magnesium, Potassium, Fruit and vegetables was associated with lower bone loss, ALSO found that consumption of protein was associated with LESS bone loss. The conclusions for both sides of the pH test argument are hard to state as fact. It remains to say, though, that a case of skeletal harm related to protein consumption is rather difficult to insist on. This is one of the great cornerstones of the Alkaline Diet , Hay Diet and pH testing to determine health. pH Balance Diet-Does It Work? 1. That calcium and vitamin D intake are strongly linked with reduced risk of osteoporosis. 2. The case for a diet of fruit and vegetables is less clear, but there seems to be a positive correlation between their consumption and reduced osteoporosis risk. There is also no known downside to a diet rich in fruit and vegetables. Credible evidence also exists that eating ADEQUATE protein seems to be important.